Hardcover, 9 x 11.75 in. / 144 pgs / 82 color / 4 bw. Edited by Martin Henschel. Text by Donald Alberti, Martin Henschel, John Tremblay. 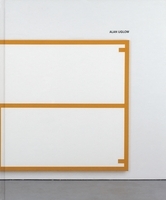 Towards the end of the 1960s, against the backdrops of Minimalism, Conceptualism and Color Field painting, British artist Alan Uglow (born 1941) began emptying out the pictorial surfaces of his paintings. Stripped to the bare bones, his best-known works are blank canvases outlined in monochromatic bands, works that occupy the space between picture, relief and architectural entity. 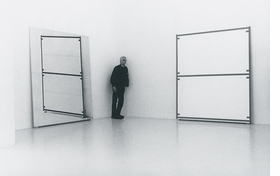 Featured image is a photograph of painter Alan Uglow during his 2000 exhibition at the Onrust Gallery, reproduced from Alan Uglow. 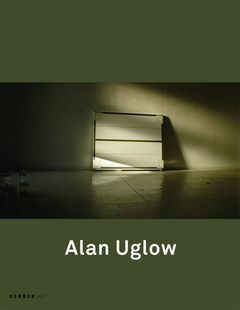 "[Alan Uglow’s] paintings are lodged in a silence that renders them impervious to the flow of time. And if and when they do contain a mote loquacity this is entrusted to the titles which point, now and then, to the fact for all its reduction, Uglow's work has a 'substantive, material base,' as he puts it. This is a basis that can be pinned down to the reality of the artist's own life and the visual experiences he has accumulated. And, should it nevertheless contain a temporal aspect, it is that of the beholder who, while contemplating the work, is invited to examine the works from every angle in order to grasp the inherent motion that arises from the changing appearance of the colors. As a result of iridescent paint and the alternations between visible textures, smoothly honed surfaces and tab-like windows that allow the structure of the canvas to be discerned, the appearance of the painting changes with the position of the viewer and the angle of the light." Martin Hentschel, excerpted from Alan Uglow. FORMAT: Hbk, 9 x 11.75 in. / 144 pgs / 82 color / 4 b&w.